East-west link tunnel protesters have blockaded three entrances of building giant John Holland’s Collingwood office as the group takes on the private sector in its fight against the project. Bike chains were placed around gates at the entrance on Tuesday morning and protesters linked arms, preventing workers from entering the office and car park. Police told protesters the chains would be cut. About 40 protesters were at the office in Trenerry Crescent, protest leader Anthony Main said about 7.30am. “We will be here as long as it takes,” Mr Main said. “Police will will have to get more reinforcements if they want us to move,” he said. Mr Main said John Holland Group had made itself the group’s first target by its involvement in preliminary stages of the east-west tunnel project. “This project is only about corrupt greed and not the public,” he said. Police advised cyclists who tried to push through the blockade to step away from the protest. Sam, who did not want to give his surname, attempted to deliver half a dozen black and silver balloons to his son, Luke, who works for the company. Sam, of Bulleen, wanted to surprise his son for his 21st birthday. “I don’t know what to do,” Sam said, before leaving with his balloons. Yarra Police Inspector Bernie Edwards said he was awaiting reinforcements to get workers through the blockade. ‘‘What has happened at all the other sites is we have conducted the police operation in a non-confrontational way,’’ Inspector Edwards said. “What we are worried about is workers have a right to go to work and we are concerned that the workers will confront the protesters,’’ he said. Nearly all the protesters had been ‘‘reasonable so far’’, he said. He said local police resources were being taken away from other priorities by the protest. Police are herding John Holland workers around to the rear of the building. An ambulance has been called to the offices after a woman protester was shoved to the ground, hitting her head on a nearby car. There were angry scenes when police tried to get dozens of workers through the front gates. Protester Kat Galea, of Heidelberg, was taken to hospital by ambulance. She had been part of the picket line and was shoved to the ground by police. Protesters took note of the officer’s name and alerted Inspector Edwards. Another protester, Ben Convey of Collingwood, said he was punched in the head by police. “When we saw the cops trying to get through we linked arms, strongly, and the police were pushing behind us and one punched me in the back of the head,” Mr Convey said. Earlier at the rear stairs of the John Holland building, workers with police tried to push through four protesters, but protester Mel Gregson said they backed away when media photographers arrived. Workers are inside the building and police have formed a line at the front gate. Inspector Edwards said police tried to convey dozens of workers through the front door by forming a line and a safe cordon away from protesters as police broke the community picket line. He said protesters confronted the workers and police; they were asked, and then directed, to allow the workers through. “Some [protesters] broke through the cordon placing the workers in fear and in danger and they were removed,” Inspector Edwards said. He said Ms Galea had got into the fray four times. “Unfortunately, one of the protesters appeared to be hurt and that is something we were trying to avoid,” he said. “The protesters are claiming this is a peaceful protest but I would have a different definition of peaceful. Even though we respect their right to protest,” he said. 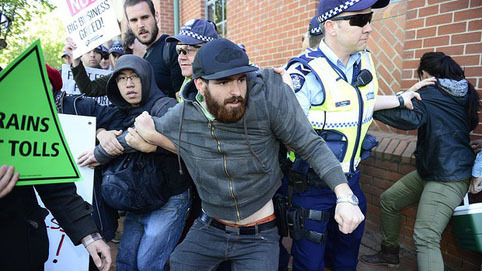 Protester Tony Murphy confronted the police, telling them they had “failed” to be non-confrontational. Inspector Edwards said no police or workers were injured. Previous ‘Blowtorch’ threat against road-link builders: Good Media Coverage – Community Rally a Success! This will bring a lot of attention and a good deal of it will be negative but the aim is clear, this is the biggest issue facing our state. Alerting the public about it and the alternatives is the priority. We should also make the public aware that it is more than just the Doncaster railway but that it is also about increasing the capacity of the Ringwood railway line which has basically reached its limit during the peak periods. A modern signalling system like that in Paris and London would allow it to carry many more trains and therefore take many cars off the roads, including the Eastern Fwy. Removal of level crossings from the busiest railway lines would also help both trains and road traffic.